I think you’ve made some positive advancements. I agree that traditional troubleshooting techniques prescribe one change at a time but (if you’re like me) I don’t brew enough to get the results I need as quickly as I need making one adjustment. It might take the rest of the year to get a desired result. However, I recently had a couple failures due to something I did when I made numerous equipment and process changes at once. I had to take a couple steps back and think I determined the culprit. That was a couple brew mistake which is a significant hit to a four beer pipeline (two on tap, one conditioning, one fermenting). I had to expedite a couple brews which could have been better had I been able to apply my normal timeline. Exactly right. I embrace learning from my failures, but I just want it to work right now. I may have shirked proper troubleshooting procedure but I've still learned more than someone who just goes out and buys something like a Grainfather, with all due respect for those who take that route. May I ask about your recent failures and how you found the culprit? It's much better to learn from others' mistakes. Sure. Long story short: either a failed o-ring in a fermenter drain valve, a QD that was used to close transfer, the yeast, or the Potassium Metabisulfate. Not really sure. Short story long: I used to brew outside on a propane burner. I heated strike and sparge water in a kettle, mashed and batch sparged in a cooler MLT. To move hot water I’d lift the kettle and pour it in the cooler. It was all gravity from the MLT to the BK and from the BK to the fermenter — no pump. I made some pretty good beer using this method but I was subject to weather conditions. I always wanted to move inside so weather did not play such a significant part of my brewing schedule. Plus I was growing tired of taking three trips up and down the basement stairs hauling equipment outside. I also realized lifting ~5 gallons of hot water chest high twice a brewday was probably not the safest. Then tragedy struck and my wife’s health deteriorated significantly. I could no longer afford to disappear outside on the Big Deck for five hours. She requires 24/7 attention. So, the decision was made to move my brewery into the laundry room. That meant new equipment and processes including a pump, false bottom, induction cooktop, and ventilation. I also wanted to add step mash capability in the small space so a RIMS tube was plumbed into the system. The result is a two vessel RIMS system that I enjoy. About that same time the LODO guys had not yet broken off into their own forum so the techniques they were discussing interested me. I added even more equipment and processes such as oxygen scavenging strike water, purging kegs, closed transfer, spunding, etc. Oh and I found some beer stone so I cleaned everything with BS remover. I *think* I rinsed well enough. So, from one brew to the next I went from all gravity batch sparge outside to adding all this new equipment and processes inside. Though I brewed a tried and true recipe, I used a different yeast manufacturer on the first beer. The resulting Cream Ale was awful. I have only produced three dumpers: a Flanders Red which was true to style that I discovered I detest, this Cream Ale, and the beer after it (I’ll have to look it up). I couldn’t believe I improved my brewery for this. Devastated having spent some good money on all this new shiny stuff to produce crap, I had to figure out amongst all this change where I went wrong. After removing, disassembling, adjusting, cleaning, sanitizing every freakin thing I narrowed it down to either a failed o-ring in a fermenter drain valve, a dirty QD that was used to close transfer, Kmeta used to oxygen scavenge, or yeast. From that day to this I don’t really know but those are the only things I found as I cleaned and removed elements. The happy ending is that I am producing beer I enjoy, safely, without regard to weather conditions. Nothing wrong with the shotgun approach to troubleshooting when it's cheap, easy and gets it done. My journey from hauling stuff outside and manually moving hot water and filled glass carboys, to a dedicated indoor, electric, no-lift brewery, has taken a similar path. Except for the ailing wife part. Best wishes with that. Designing and building my brewery has been just as rewarding as the brewing process. FWIW gimme a kolsch over a cream ale any day. I had a similar thought on the "shotgun" approach in this case. You've improved flow, you've got a new mill, everything you've done is bound to be an improvement. So if the next brew goes well, proceed with all the modifications on the "ain't broke, don't fix it" principle. Of there's still something suboptimal, then troubleshoot systematically. LOL. The wife drank Little Kings as a wayward youth so I brew a Cream Ale each year for her birth-month. Besides, it’s too good to be beer! Cheers! Handling my thirst is like trying to catch a bullet with a pair of pliers in the dark! Ha! Too funny! Never heard of little kings but my Dad used to drink Genesee cream ale when I was a young man. Dang. Now I might have to brew a cream ale. I'm using WLP029 for it though. I brewed a Dunkel last night and made some observations. After mashing in, both sight glasses of the manometer showed 10.5 gallons before recirculating. Begin recirculation after 10 minutes. Manometer went down to 10.25 with level in lower sight glass showing just a bit lower. I played with the flow a bit and manometer level went down slightly as flow increased with both sight glasses eventually levelling out. I don't think I ever went past half throttle. I should have gone full throttle to see what happens but I didn't want any issues on this brew. I'll try in the future. Gave it a good stir after 15 minutes. Grain bed was firm but didn't seem compacted. Stopped flow and let it rest 10 minutes before resuming recirculation l. I later determined flow to be ~.5 gallon per minute when timing how long it took to fill a gallon in the kettle. Manometer started with the lower sight glass showing a bit lower but both sight glasses eventually leveled out. Upon transferring to the kettle, wort looked pretty clear and I was quite satisfied with it. Although 28 srm probably wasn't the best choice to test clarity. Preboil gravity came in about where I expected at 1.051 at 2.45 quarts per pound. After lautering, top of grain bed was slightly (1/16") pulled away from sides of tun only on the front half of the tun(above the valve). Crush was .045" and there was zero flour in the teig. Wish I could get a picture but my camera kept crashing every time I turned it on. It's fine now, go figure. Other observations: MLT is direct heated by a hot plate on a temperature controller with the temp probe in a thermowell after the pump at the inlet of the recirculation arm at the top of the tun. Kind of a pseudo RIMS with 2.5 gallons below the false bottom. The dial thermometer 2" above the false bottom consistently shows 6° below the temp shown on the controller. Does this indicate poor flow through the grain bed? All my thermometers are calibrated with ice water. When raising temp to mash out, temp would spike at 170 then level out after a couple of minutes at 160, spike at 170 and level out at 162, 170 and then 164 and so on. Indicator of poor flow or is .5 gpm too slow? I'll experiment more with a faster flow next time. Mash pH 5.20 at room temperature. Edit: I stirred upper inch of grain bed with about 20 minutes left in the mash. I think that’s a great run. Your cycle between 160-170 shows you’re getting some circulation. My system does that when I have a large error between the set value and perceived value. It calms down when temps even out. The wort across the element is heated to temp and then is replaced with cooler wort which will then be heated, etc, etc. After a while your temp cycling should be far less as the wort temp evens out throughout the mash. The 6*F low in a stratified layer concerns me more than the cycling. It should also even out over a few cycles. If it doesn’t I believe that is an indication of poor circulation down to that level and should be addressed to even out the grain bed temp. Simple stirring could solve the stratification. So if my recirculation was perfect, would the top of the grain bed be in contact all the way around the sides of the tun after lautering? Since mine was slightly gapped above the valve/outlet (I have a 90° pick up tube in the port directly behind the valve), might there be some channeling along the front wall of the tun? This could explain the temperature difference at the dial thermometer which is 2" above the false bottom and extends in 4"? If that's the case, might it help to extend the pick up to the center of the tun? Hope I'm not over thinking this. I'm not necessarily chasing perfection, I just want to understand what is going on. Joe, was the bed pulled away with liquid above it, or did you see this only after it was completely drained? I wouldn't worry about how the spent grain settles after it's drained, only if there's channeling during the run. OTOH, I firmly believe in having the draw off at the center no matter what; you can't do better to ensure even drainage as across the bed. If possible do it. I didn't notice until the bed was fully drained. In the past, it was as much as a 1/4" gap all around the top. So things are vastly improved and I'm nitpicking. But the 6° difference in thermometers has me curious. I understand you have to expect some stratification of temps but I expected a continuously recirculating mash to be more homogeneous than that. 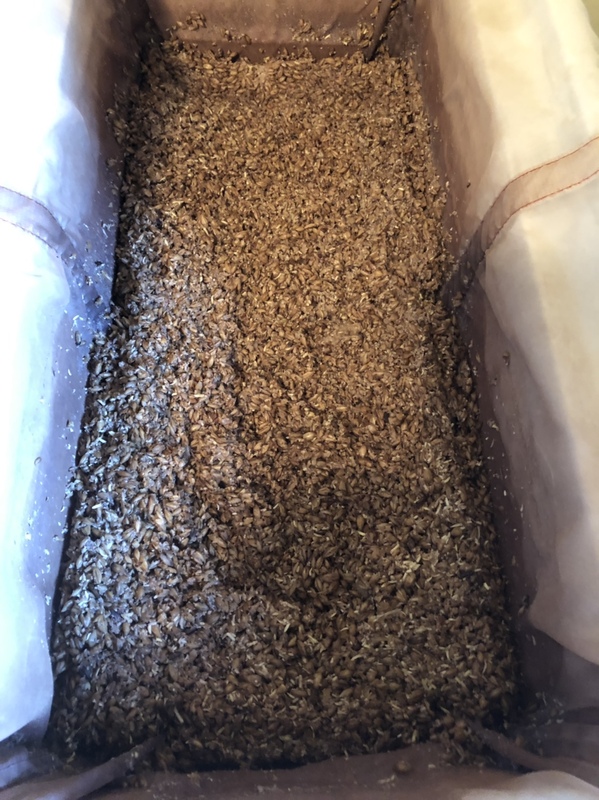 Here’s my undisturbed grain bed after a brew day. With this batch I obtained 91% mash efficiency (2 points higher OG than planned) and 72% brew house efficiency (both calculated by BeerSmith). I plan 70% BH but this additional 2% is within my brewery personal tolerance. As long as I can reliably estimate OG when developing a recipe then hit the estimate within 1 or 2 points plus or minus on an actual brew day is good for me. I probably leave more wort in the kettle than others in an effort to reduce trub in the fermenter at the detriment of BH efficiency. I know I could simply dump the kettle contents into the fermenter to increase Brewhouse efficiency but I prefer not to.